If beer didn't contain any alcohol...? This batch of Weizenbock was brewed just over four months ago using a yeast cake from a batch of hefeweizen (easy way to get enough yeast cells). I wasn't too happy with the hefe because the yeast character was too restrained, but in a big beer the same yeast strain had more character since it had more sugar to eat. The grain bill was pretty standard (malted wheat, Munich etc...), but it got its great caramel and dark fruit character from a half pound of Simpson's Extra Dark Crystal which I have fallen in love with for dark German beers. Appearance – Deep reddish brown, pretty clear. Beautiful tannish head that just won't go away, some lacing. Good carbonation evident streaming through the beer. Smell – Faint banana, caramel, dates, and light coffee. Nice complex blend of aromas, this yeast was very light on the banana, which I don't mind for a weizenbock. There is a whiff of alcohol as well, not too surprising for an 8% beer, but some more age might help as well. Taste – Many of the same elements from the aroma, caramel, dark fruit, banana, and a faint toasty/bready roasted malt aroma. Balanced to the sweet side, due to the low IBUs, but it isn't syrupy or overly sugary. There is also some of that clove spice that is a classic part of the style, but it is restrained. There is some alcohol in the finish, but nothing that is unpleasant. Mouthfeel – Solid carbonation, bordering on being spritzy. The body is medium full, very nice. The finish is clean, the alcohol and carbonation help make up for the lack of bitterness. Drinkability & Notes – Really solid, this is about perfect for my taste in Weizenbocks. I might add a bit of melanoidin malt next time just to drive home the bready malt, and back down on the crystal a hair to make way for some fresher fruit character. I would also go with the Wyeast 3068 in place of the White Labs 300 to boost the banana and clove. I'll be entering this one in a competition or two to see how it does. hows that imperial stout lookin? 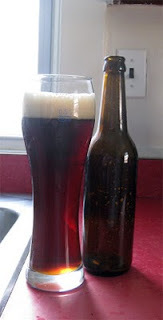 The imperial oatmeal stout is carbonated, but I'm waiting for the flavors to mellow a bit before doing a review. The different versions are all pretty tasty, but i like the plain and maple/coffee especially.